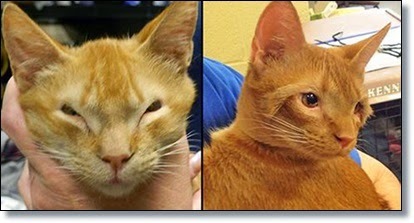 A cat born without eyelids is getting a second chance and a new owner, according to WESH. In March, the 11-month-old cat was found roaming the streets of Stuart, Fla. The Humane Society of the Treasure Coast took the cat in and named him Sauron. Sauron was checked over by veterinarians, who determined that multiple surgeries would be needed to fix his eyelids. His eyelids were damaged and his eyes must have pained him as if he constantly had something in his eyes. 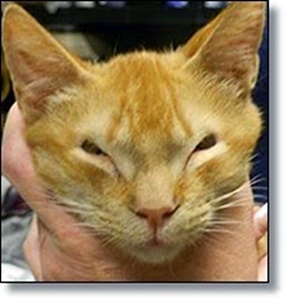 The damage to his eyes would continue to get worse, and if he didn’t have the surgeries, he would go blind, the Humane Society was told. The surgeries would cost thousands of dollars, yet that didn’t stop two of the Humane Society volunteers who fell in love with the young cat. Les Thomas and Roxie Smith decided to foster him until he could be adopted. And they went above and beyond giving him a foster home. They helped save his sight and used their own money to do so. Sauron was taken to the University of Florida in Gainesville by the volunteers. For the first surgery, Smith said corners of Sauron’s mouth were used to make new eyelids. Two more surgeries followed. The surgeries cost more than a thousand dollars out of their own pockets. While at the University of Florida, third year veterinary student Chelsea Mendola saw Sauron, and she too fell in love with the cat with the sweet personality. So much so, that Mendola adopted Sauron on Tuesday.